I have to admit that every so often I get stuck for ideas on what to make for dinner and it generally happens to be when I only have 20 minutes to cook it. Before the panic has a chance to set in, I turn to an oldie but a goodie, my trusted quick pantry minestrone. Besides the convenience of using pantry ingredients, which are nothing to be afraid or ashamed of, especially if they are additive-free, many of them are picked at peak season making them extra nutritious and flavourful. My pantry is always stocked with (organic) stock, canned tomatoes, bean medley and I keep a freezer-friendly array of mixed vegetables, store bought and self-selected. It’s a great little inventory that can be transfored in minutes into nacho or spaghetti sauce, added to pizza toppings, risottos or salads. Pasta is always there too. Whether it’s spaghetti that can be broken up into smaller pieces, or elbows, shells and penne. Out of all the pantry dishes, minestrone is one of my all time favourites. It is one of the easiest and most flavorsome soups and I often make it when it’s cold and gloomy outside. It’s packed full of vegetables, it’s filling and hydrating – drinking enough water is something we often neglect on cooler days, and this is a great way to help keep the tank full. With colder weather beginning to tease us every now and again now, it is time to tuck into some of the foods that offer sustenance and warm comfort. So, if you get stuck for ideas on what to make for dinner, consider cooking up this lovely one-pot soup. Feel free to substitute any of the below with fresh veggies if you have more time to wash, peel and chop them. Many pasta types can be used here as well: spaghetti can be broken up into smaller pieces, elbows, shells and penne are just as good. Place all ingredients, apart from the pasta, in a large stock pot and bring to the boil. Add pasta and cook for a further 7-10 minutes or until pasta is al dente (cooked but still nicely firm). Serve hot with a grating of pecorino or shavings of parmesan. I think that there’s a time and place for fluffing around with specially imported ingredients and french cooking techniques, but when you only have half an hour to get dinner ready, recipes like these will always win! Looks amazingly filling and healthy. Minestrone is one of those great soups where you can adjust to what you have and works well with things that can be found in the pantry. I would love a nice bowl of this now, that would be just perfect, thank you! 🙂 My pantry doesn’t permit me making this myself at the moment, seeing as we’re moving apartments. 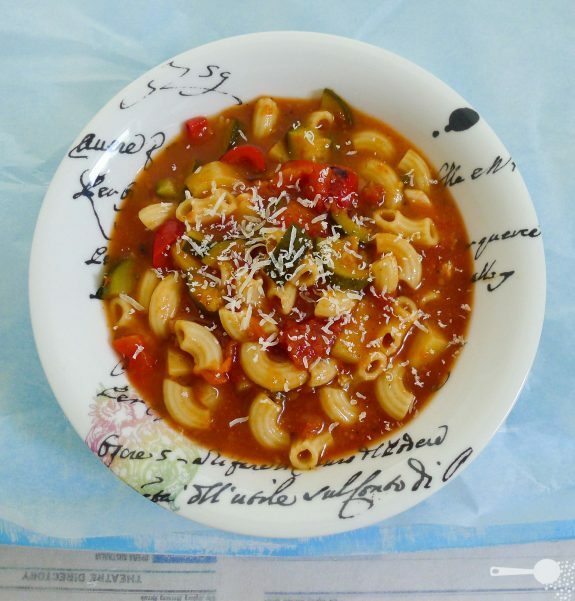 I love making meals in just one pot…and I particularly love minestrone soup! This one will get a whirl when winter hits.